This is one of my early stories and got this comment from Emma Oram -- editor of Vintage Script magazine -- who has a degree in Medieval Studies from the University of Suffolk. Anyway, this is my personal take: Well, what a story! You certainly know how to tell a tale and the imagery is very striking, as is the sense of suspense. Keep up the good work! This comment came from Yezall Stongheart -- author of Bring 'em' back alive. 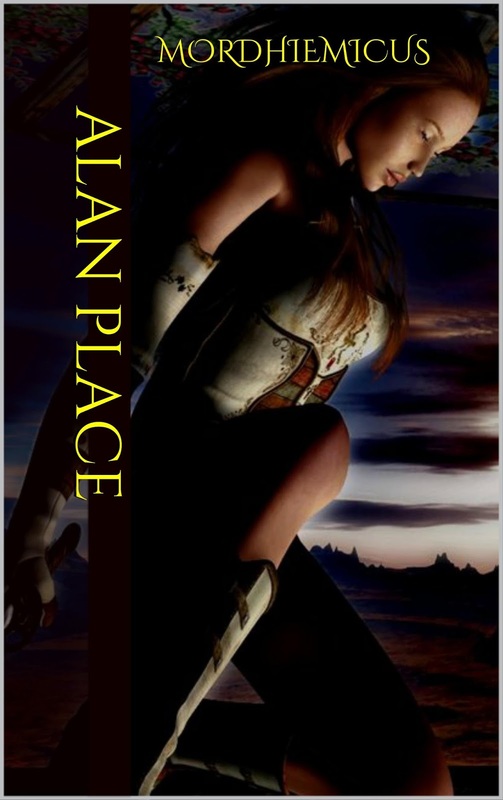 Al Place has a way of spinning a tale that gets you turning the pages only to realize you are on the last page! The story was full of action and just when I was ready for more the story ended, although it was a complete story. The dialogue was exciting and the characters real. Looking forward to the next one! The town of Mondoria was in full colour as the Feast of Tallier started. Banners hung from the flag poles and windows. The hostileries had taken on extras staff to be open all day for the three day festival. The town thrived not only from the people coming from all over Madior province for the festival. Mondoria had become the major sea port for the area. The other sea port had been Kerranmore, but trade routes changed. Kerranmore now lay deserted, populated only by thieves and outcasts. Jesters danced along the streets as children followed, laughter filled the air. From the hostileries could be heard the sound of games, and men making deals. The women folk wandered around taking in the vast array of foods brought from afar for the festival. Now was the time to treat the family to wholesome meals, rather than the usual gruel of watery stews. Money was not easy to come by, but the town always made a great show for these three days. Decked in bright Harlequinesque costumes the jugglers and acrobats thrilled the crowds which gathered around. Their antics both daring and entrancing held their audiences enthralled. The man’s clothing appeared torn and tattered, as if he had travelled a long distance. He glanced about him, as if trying to find somebody, or something. Yet he never looked back. Was he too afraid of what lay behind him, to chance a glance of his pursuers again? Moving from shadowed area to darkness, the stranger avoided many eyes on the streets as he passed out of sight of Tom. The baker’s day was too busy to pay heed to a stranger, besides the festival brought many to town. Some passed through and others stayed. The hostileries and bakery would be working through the night, and not until the morn of the fourth day would they rest. At this stage they would provide a last meal for the travellers as they left Mondoria to go home. The festival started many years ago when Tallier left the town on a mission. Some of the people said he had been a seer who wanted peace to find his way. Other people said he had been a soldier who tired of fighting and became a hermit in the hills to the North. No matter what you believe, he left a prophecy. I, the one known to the town of Mondoria as Tallier leave this warning to the town’s people. I set this warning for you, if you do not change your ways, and desist from worshipping the lures of flesh and coin. There shall come a day when a storm from the skies shall burn the town to the ground. Only the house of the believers shall remain untouched, as I deem them true to their beliefs. Not long after Tallier’s disappearance; a large amount of money had been found at the foot of the rock face around which the town had grown. The Church of ‘The Sisters of Tallier’ took this to be a sign from Tallier. With the money they moved from their old run down church on the edge of the town. The Sisters got help from the town and moved the church to the top of the cliff overlooking the town. They thought of it as a way to watch the town’s growth as the main sea port. This would have been Tallier’s wish. With growth and wealth came many problems. Some were man-made such as the ladies who walked the streets and the increase in hostileries. More insidious was an enemy which skulked in the underworld. With shipping came the rats, a horrible plague. These beasts evolved as species do. Before long the creatures could walk on their back legs. The town’s people called them Mandorils. These creatures were a cross between man and rat. Mandorils have huge protruding front teeth and deadly claws capable of tearing meat from bone. Filth became the home of the Mandoril. The more the town spread, the greater their numbers became. No matter how many they numbered, they stayed out of sight, coming out at dark to feast on our waste. All through the town’s growth, the church stood on the cliff over looking it. Among the town’s people were a group known as Flagellists. These people saw what was happening to their once lovely town. Their punishment was to whip themselves to pay for the sins brought to the town.